Clogged toilet pipes, flooding, cracked or burst pipes, failed sump pumps and other causes of sewage backup can pose very dangerous health risks, in addition to ruining furnishings and personal property. Because of the serious risk to your family’s health from sewage backup, the removal and cleanup process should begin immediately – and only be trusted to a professional sewage cleanup specialist. Whether you have a commercial or residential sewage cleanup problem, it is essential to have it addressed by a professional sewage cleanup company immediately. Air drying or fan drying does will not prevent bacteria, toxins, mold, mildew, airborne viruses and diseases from taking root in your walls, flooring, furniture, fixtures, personal property, HVAC systems, ductwork, and other property. Sewage backup can only be completely and safely cleaned using specialized disinfecting cleaners, fast acting deep extraction equipment, and hazmat protective gear. Only sewage cleanup personnel who are professionally trained in proper hazardous waste cleanup and equipped with specialized sewage disinfecting products should be trusted to clean sewage backup. Aaron’s Restoration makes sewage cleanup their highest priority – to save as much of your possessions as possible and to protect your family’s health. Our Troy MI based sewage cleanup company uses the latest sewage cleanup technologies to extract all moisture and thoroughly dry carpet, floors, walls, furniture, and your valued property and possessions. 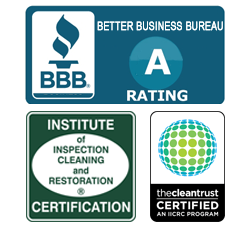 We also have the state-of-the-art products to kill all bacteria, germs, mold, mildew & viruses – always using environmentally safe cleaning products – leaving your building, home or facility completely dry, and completely germ-free and sanitary. Call Aaron’s Restoration 24/7 for your Sewage Cleanup Needs.